If all else fails you can fall back on fruit punch in an IV bag. Tasty, cheap street food options exist even for the diet-impaired! 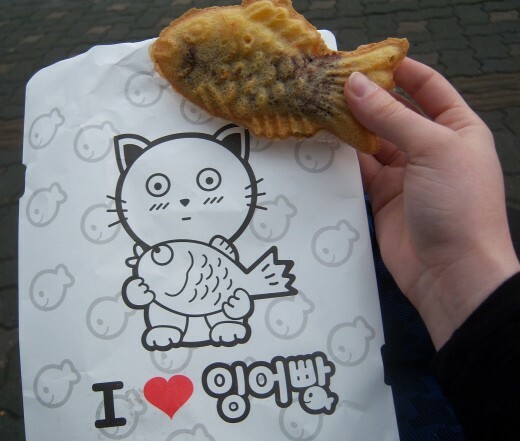 As you might imagine, there's not a whole lot of it - nearly everything in Korea contains meat, seafood, wheat, or some combination of the three. It can be like navigating a dietary minefield, but don't get too discouraged just yet. Believe it or not, some street vendor fare is both vegan and gluten-free. Am I absolutely sure? Is it certified? Is it also organic and fair-trade? Of course not, doofus, you're buying it for a dollar from an old lady in a tent on the side of the road. Unless your diet absolutely requires you to be very strict, you're going to have to learn to let go of your lofty expectations at times. If you come to South Korea, you're going to be hungry, and you're not going to care that there's dried squid and fish jerky sitting less than an inch away from your chestnuts when you're lucky enough to find them. 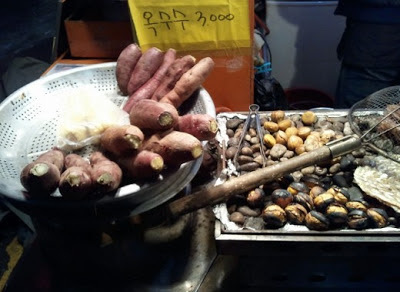 Pictured above is the holy trinity of hot winter street food (though it doesn't vary too much from season to season) for people who don't eat meat, can't eat wheat, or both: steamed corn on the cob, steamed sweet potatoes and roasted chestnuts. They cost about 2000, 3000 and 5000 (for a paper bag of about 10) won, respectively. I'd never had a chestnut before coming here, and actually, had never really heard them mentioned outside that classic Christmas carol, but they're pretty great. They're large, starchy, filling, and surprisingly reminiscent of potatoes imo, but fairly low in calories. If you're attempting a meat and gluten-free diet in Korea, they can also serve as an important source of B vitamins, potassium, iron, folate, fatty acids and other nutrients. As gluten intolerance and food allergies most often occur among people or northern and western European descent, Koreans don't really do gluten-free. Generally speaking, anyone beyond their 30's probably doesn't understand the concept of an alternative diet at all, so I wish you the best of luck in effectively communicating your needs or desires to them. Luckily, though, rice-based cakes and similar goods are very common, so you may find that you actually have more options in Seoul than you did at home, if you come from a smaller town. red bean crumble-covered are common types/flavours. 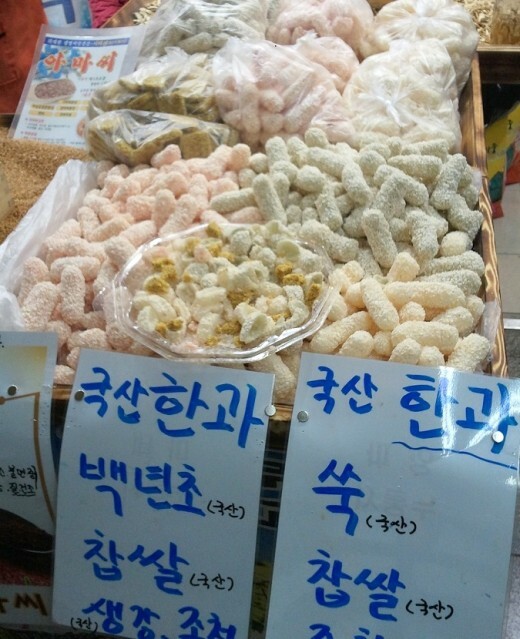 Ddok (rice cake) comes in many varieties and textures, and to be honest, most of them aren't that nice. It's either chewy and sticky or steamed and spongy. Warm steamed or microwaved rice cake is probably the closest you'll get to gluten-free bread outside Seoul, but eat it sparingly. Though many people can't tolerate wheat, it's actually healthier for you than rice flour, as it contains more fiber, vitamins, and minerals, and is lower in calories. Many Koreans think it's the other way around - which is good for domestic agriculture - but it's basically condensed, empty-calorie starchy starch goodness, and eating a lot of it will pack on the pounds. 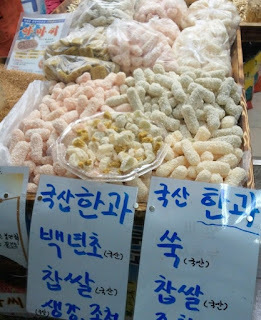 There are also crunchy puffed rice snacks and crackers galore, and they cost nothing. For a quick, filling snack to hold you over until a meal or as something to stow away for a rainy day when you've run out of groceries, these are perfect. They can usually be found in a truck or street stall while the chewy and steamed varieties are more common in the subway. kind of like kettle corn. Additionally, there's also one type of common, extremely cheap traditional Korean cookie I've found at street stalls that should be gluten-free. It's a long cookie with little bits all over the outside, either plain or subtly coloured pink, green, orange, etc. The orange ones contain pumpkin flour, which also gives them a very slight flavour, but I'm not sure about the others. It's possible that the pink ones are strawberry. They're handmade and will vary a bit, but for the most part they're light and crispy rice cookies with a thin wafery outside and a chewy interior, sometimes with honey. Watch out if you don't eat animal products, though! I'm almost completely sure they're made with gelatin. You can snag a bag for less than one U.S. dollar, and sometimes vendors will give you some for free (as with all rice snacks). Do keep in mind, though, that the chances that certain things contain equal amounts of wheat and rice flours are quite high, and the chances of cross-contamination at some point along the supply chain are high. 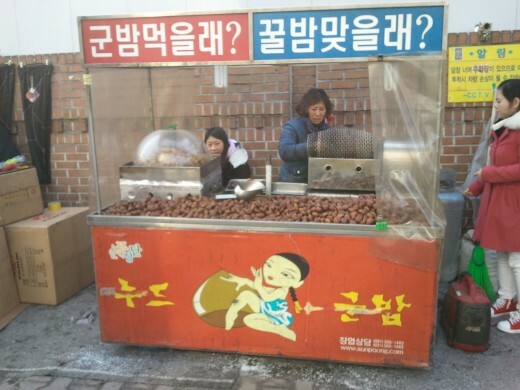 Even if you have a native Korean speaker helping you and they say, "She says it's only made with rice flour, nothing else", there's still a good chance that this has occurred. Many of these options should be viable, but don't get too excited and go overboard before you know what works for you! In some places you can find fresh fruit kebabs, usually made with pineapple, watermelon, and honeydew. Bananas and oranges are also very common in Korea, though apples are a little more expensive. Once I even found a vendor selling strawberry, apple and grape kebabs dipped in the transparent red sugar candy that hardens into a shell - like the kind sometimes used for candied apples on Halloween - for less than a dollar apiece. 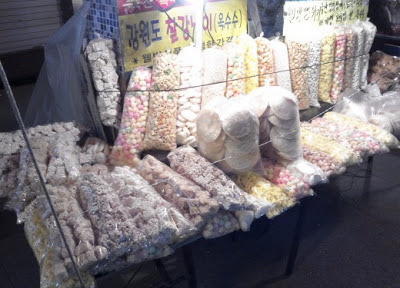 In addition to those candies, there are traditional Korean sugar candies that come in a variety of fun shapes and sizes, including the occasional foot-tall Gundam-esque robot. These are hard, darkish yellow and sort of transparent. Individually-wrapped candies like Bit 'o Honey and Chupa Chups are also quite common and popular. For those who are vegetarian but don't want or need to avoid gluten, well, there are doughnuts, pastries, breads, noodles and all sorts of carb-a-licious goodies everywhere! There are also these wonderful things called tornado potatoes that are whole potatoes cut into a ribbon and skewered, then brushed lightly with batter (though not always, they're sometimes batter-free!) before being deep-fried. 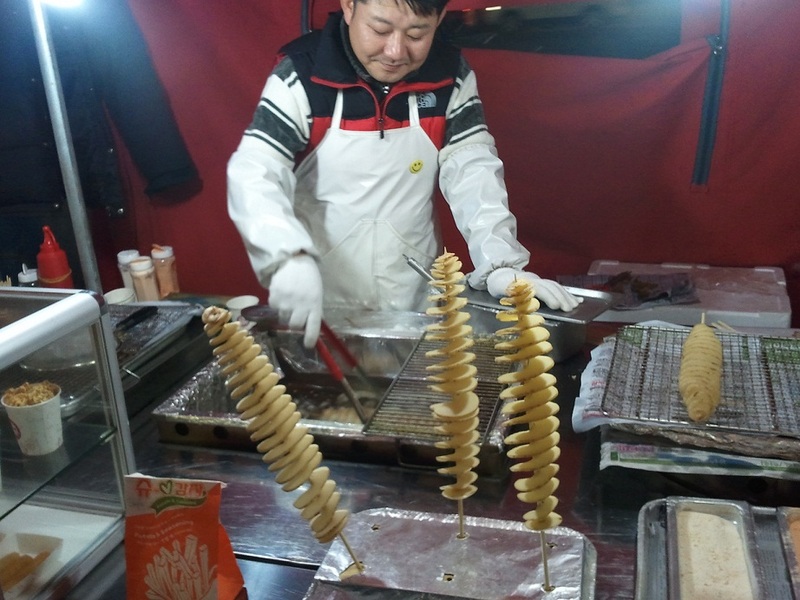 The fryer oil in Korea isn't usually vegetarian because it's shared with chicken, calamari and whatever else people are serving side-by-side, but the Swirly Potato Man I know and love only makes one thing with his fryer. They're slightly crispy on the outside and still soft on the inside, and there are little trays of seasoning in flavours like chili, cheese and onion that you can roll your fresh fried snack in (if you needn't avoid wheat!) as you please. It's awesome. Mmm, warm fried potato snacks make everything better.